April 1, 1946, the ice was gone from the Lake of Bays. 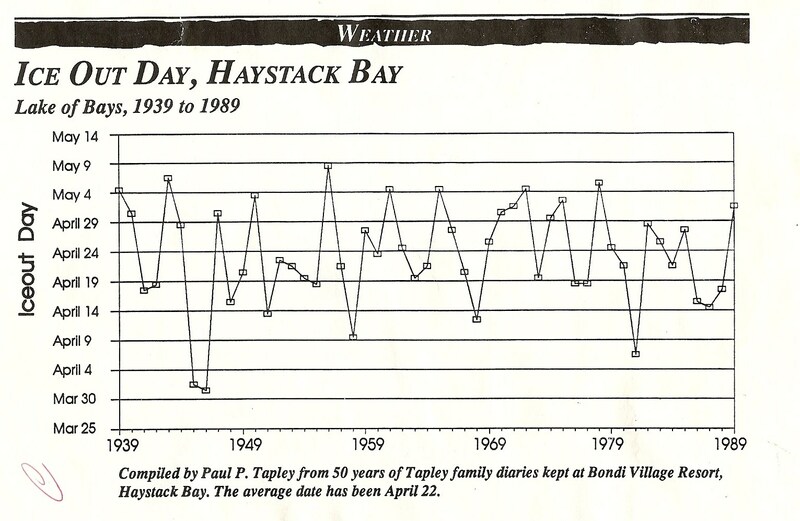 That's the earliest we've ever recorded, and it's taken from a chart our father Paul kept for over 50 years. This year, it could be close to that record. particularly if the forecast is correct, and it zooms up to 21 degrees this week. Last year, it was April 21st when the Lake was completely free of ice. It won't last that long in 2010. It's already loosened along the shores, and is starting to shift and move. A good wind would send this ice piling up along the shorelines, but so far this year, it's been a quiet melt out there. The weather has been fabulous for us shore-bound types, drying up very quickly underfoot . It's dried up, in fact, faster than we've ever seen it do so, which is a bit worrying. It's dry. Very dry. Labels: Lake of Bays. Ice Melt Chart for Lake of Bays. Despite the cold snap, which encouraged the lake to make ice rather than melt ice, spring is here and the water is rising. 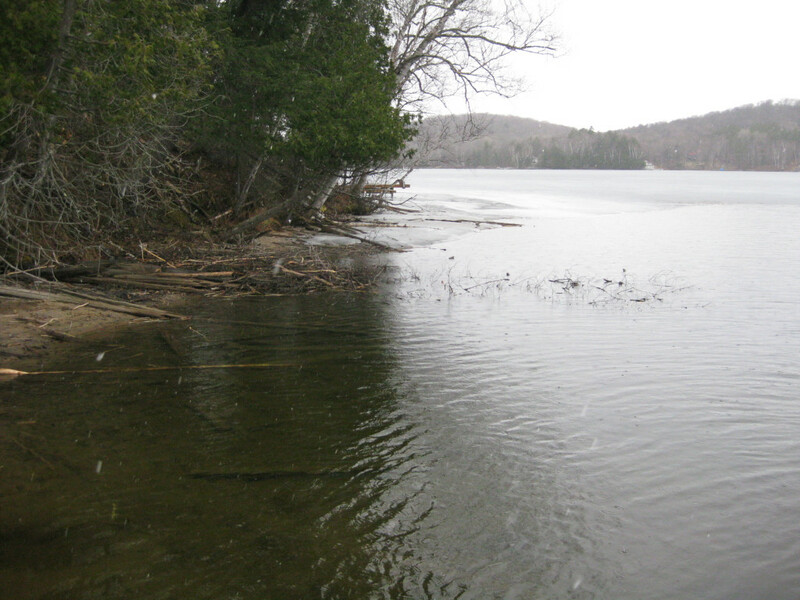 Lake of Bays is fed from the headwaters within Algonquin Park. The Park is higher than we are, in altitude, so the thaw comes a little bit later there, and we're now seeing Algonquin's Spring arriving along our beach. The sandcastle boat built over the March break is providing us with a handy reference point at the Main Dock. The future of this proud vessel is not looking particularly good... We predict that she will soon be finding her very own "watery grave", but with the loss of no life and the introduction into the ecosystem of no deleterious substances. It's all good... Another boat will rise along the shores this summer, no doubt! Meanwhile, our "beach", the wide expanse of sand that greeted our grandparents in 1905, is gradually receding as the water's rise. The silver lining here is that we still have a wondrful sand beach -- and the water is shallow, with an excellent sandy bottom that is ideal for little feet (and big feet) and that warms up quickly! When Katie was here last summer, she came out for Dark Skies and Wolf Howls, and we were successfully able to deliver on both topics! Katie made me this wonderful drawing, which still hangs on my fridge. Here at Christmas, she came to my door to ask if we howled for the wolves in the winter. I explained that yes, we could... but the packs are on the move hunting, and it can be much harder to get a reply. I tried to soften the possibility of my epic failure at Wolf Karaoke by noting that I had not heard the wolf pack in several weeks, and thought they were out of voice range. Nothing ventured, as they say, nothing gained, and Katie agreed to howl with me. We did a very soft voiced rehearsal, prior to cutting loose with our best howls... and WHAM! the wolf pack picked up on the Lookout Hill, and sang and sang and sang. Katie had a smile a mile wide. "In my class we all had to write a speech and then say it in front of our class. Everyone got to choose their own topics, unless someone else was doing the same topic as them. At first, I wasn't sure what topic to chose. Then, I came up with the best topic EVER! Guess what it was? It was wolves. Since then, I have said my speech and gotten a good mark. Choosing wolves was a good speech topic. The first paragraph says something about Bondi. This is my first paragraph: Honourable Judges, Parents,Fellow students, Guests: "Have you ever heard a pack of wolves howling at night, or a lone wolf howling nearby? 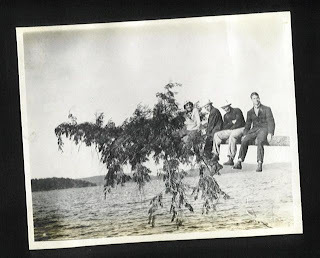 Every summer for the last few years my dad and I have gone to a cottage on the Lake of Bays in northern Ontario. I became more interested in wolves by listening to their different pack howls. When I come to Bondi this summer I hope that I will get to hear the wolves again." We couldn't be more proud. Studies tell us that standing up in front of a group of strangers to give a talk is one of the most intimidating experiences. How wonderful that our timber wolf pack welcomed Katie in to the their song and helped her stand proud and brave -- like a wolf -- to talk about them! Way to go, Katie! Labels: school speeches. Algonquin timber wolves. Bondi Village Resort. We've been enjoying wonderfully warm weather, for March. The snow is in full retreat, remaining only in the snow banks and on the northern slopes. You can hike to the toboggan hill in sneakers, check out the emerging wildflowers, and then jump on the flying saucer and race down the hill, because that hill is in a gully, facing almost due north, and sheltered by trees. The snow will linger there. The lake has been beginning to open up, with the ice-away on the neighbour's boathouse now pushing open water more than half-way across the narrow entrance to Bondi Bay. As the ice gets ready to leave, it darkens, filling with water and no longer reflecting light. Then it starts to break apart, the long ice crystals chiming as they strike together. The lake sings to welcome spring. But -- there is always a but, isn't there? -- the old adage about March coming in like a lamb, going out like a lion still holds. This morning, it was 15 below. Frost on the grass. Ground iron hard. And the lake, rather than chiming in the spring thaw, was making ice. Long rumbling electronic pulses of sound rippled across the bay, as the ice hardened, pushing against more ice that was also hardening and expanding. It's a wonderful, alien sound -- but we're more thrilled when we hear it in February, when the lake is getting stronger. 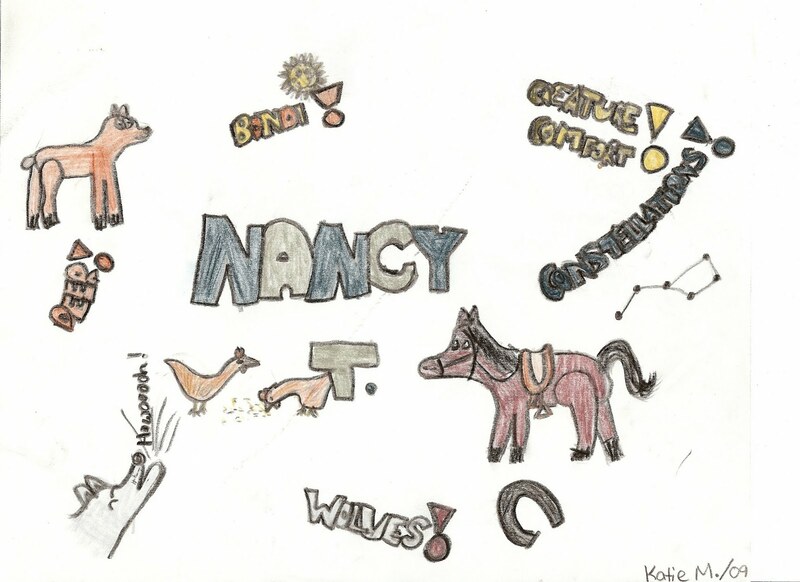 One of our guests, Kelly, has sent us the most wonderful piece of art. You can read more about her on her own blog. She has been involved in an art project called Artshine Travelling Sketchbook Project, part of which involved exchanging sketchbooks with the others in the group. Each person added their own page to the sketchbook before returning it to the owner. What a wonderful idea! 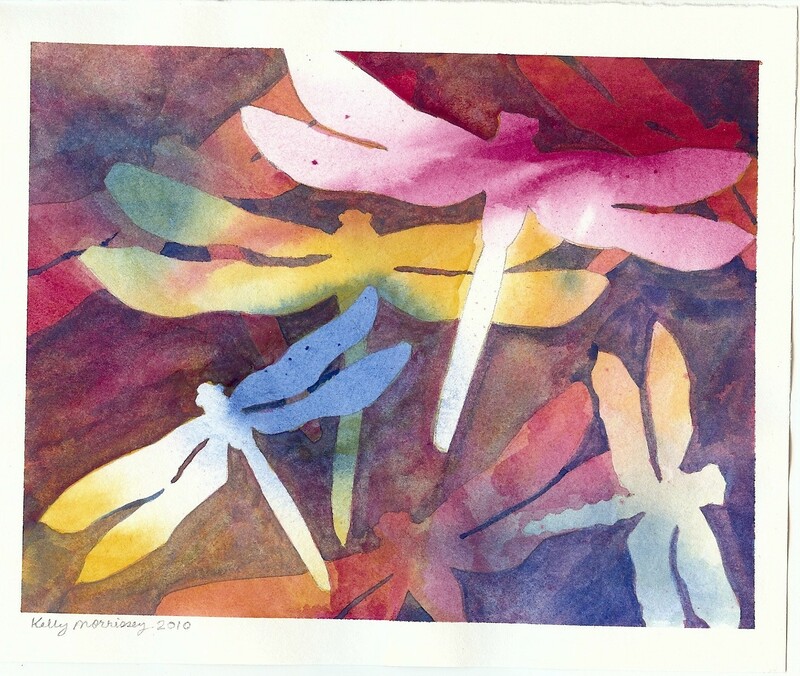 Dragonflies caught Kelly's attention... as did watercolours. Neither of which are particularly easy media ato work with. The result is wonderful. We can't wait to get this framed, and hanging up for everyone to admire. Guests at Bondi will have noticed that there is original art in all of our cottages. Some comes from our talented local area artists, but a lot of it comes from our equally talented guests. It's always a delight when a member of the Bondi Family provides us with some of themselves, through their artwork. Thank you for sharing this with us Kelly. It makes me smile, thinking of summer nights and the songs of wings. There are a great many beautiful houses on the Lake of Bays. Tuesday, I had the chance to walk through one of them. It's for sale, and a friend of mine is the Realtor. The cottage has undeniable Wow factor. If you're in the market, you should see it. Turns out, however, it wasn't the only house on this property. 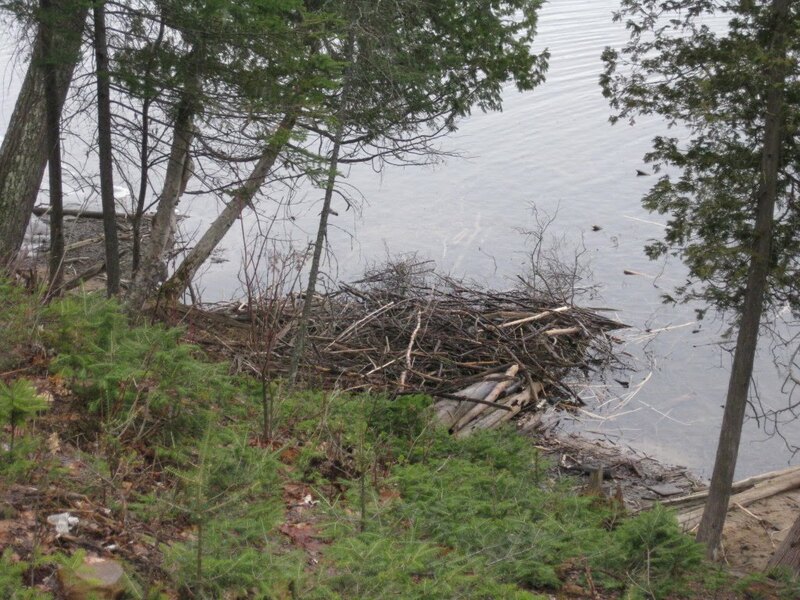 Just to the side of the dock, near the bend in the shore that provides privacy from the adjacent human neighbours, there is a beaver's bank house. That brought me out of the cottage, scurrying down to the dock for a closer look. Lake levels are very low right now, so more of this is visible than the beaver probably intended. 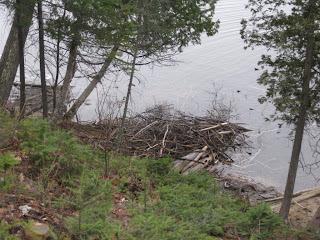 You can get a pretty good look at his "larder" -- that scraggly collection of branches anchored on the lake bottom near the house. Beav takes advantage of these during the winter months, selecting something from the menu, taking it into the house to dine on the bark, then tossing the cleaned sticks out to lie along the shoreline. 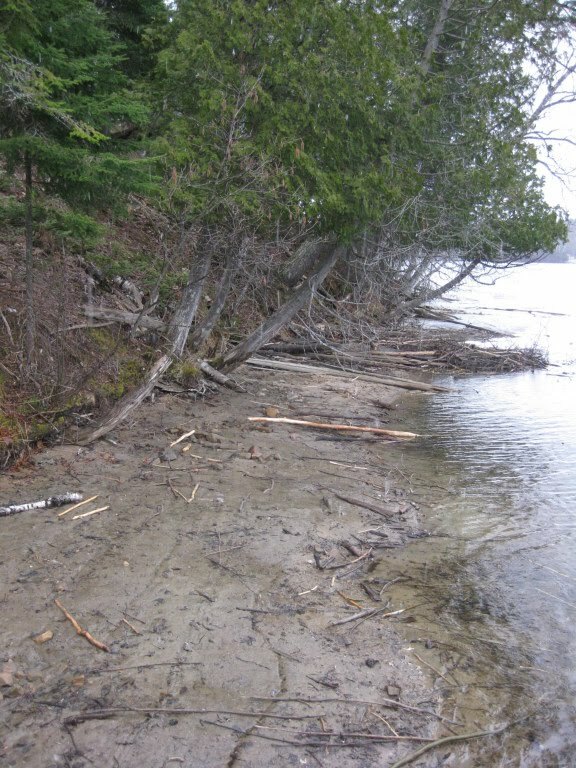 There will be some clean-up required along this entire shore come summer! On the plus side, if you've got curious kids, these sticks are wonderful -- you can see the tooth marks in them, the 'pencil sharpened' ends. They are collectibles. I know every summer, kids at Bondi Resort are thrilled when we find beaver sticks. Sometimes that's not easy. There is nothing more determined than a beaver with a dam or a house to build. Several years ago, we had one move into a small pond on our property. Equipped with his Beaver Engineer Degree, beaver set about turning that small pond into a big one. Who says people are the only animal that changes their landscape? 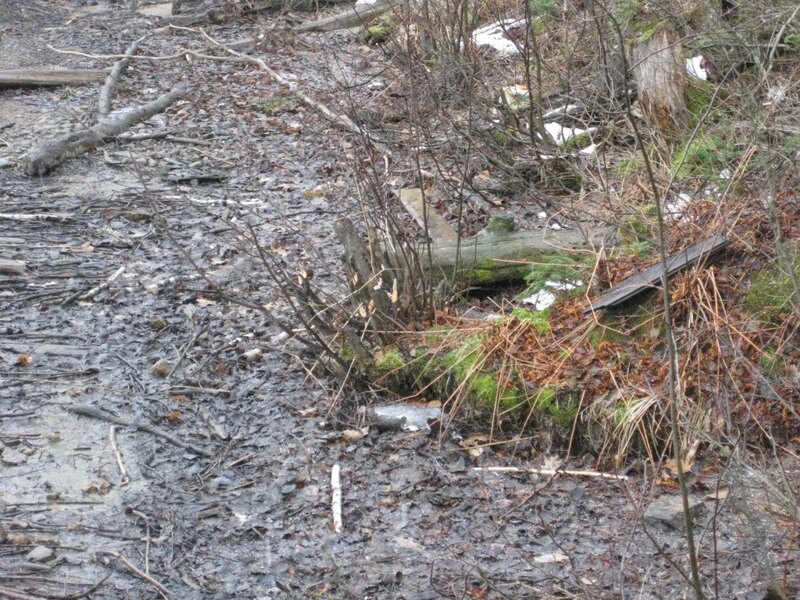 Problems arose when the beaver's dam works resulted in washing out an access road and culvert. Which we repaired. And repaired again. At one juncture, Brian was going to the pond every morning, climbing down into the culvert and tearing out the previous night's dam building efforts -- which the beaver was cleverly incorporating INSIDE the culvert as the most efficient location. This went on until Brian hurt his back. Half time score: Beaver ONE, Brian ZERO. Brian also has an engineering degree, so he sat on the bank studying both the beaver and the situation, and the final solution incorporated creating a dam of his own -- complete with stop logs to control water levels, that let the pond fill up, but provided a spill-way feature to protect the road when it overflowed. 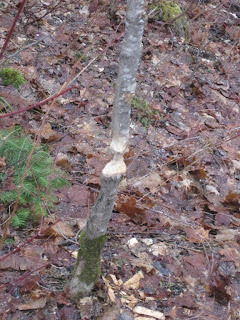 Beaver seemed content with this, spent the winter, ate all the trees in the area, and then moved on into the big Lake the following year. Left behind are mementos -- trees whittled down until there is nothing but the trademark chisel-sharp ends left. In one night, Beav 'liberated' over twenty small trees along our waterfront. This meant war... and by the end of the day we had our remaining saplings kitted out in full metal jackets. Some are still wearing this armour years later. Beaver stepped it up. He dropped a 40' poplar through the roof of one of the cottages. The roof held, except for the holes where the branches poked through into the living room. 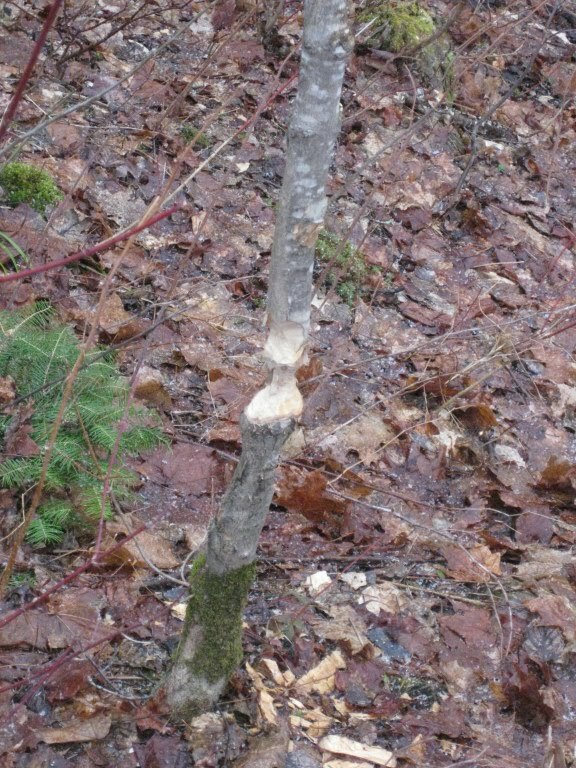 Chainsaws came out, tree was removed, roof repaired... and Beaver took away all the smaller branches that he'd wanted in the first place. It was entertaining to sit quietly in the evening and watch the beavers draw V's across the lake. It was fascinating to watch them logging. They are superbly adapted for this, horrifyingly efficient, and never stop to inquire about permits. In the big beaver ponds at one end of our property, where the River Loop trail runs, you can get a good look at the dam construction that can hold back enormous amounts of water. Up along Miller Hill Road, you can still see signs of where one ver dams broke, ashing out four huge culverts and a large section of road, costing about $100,000 to repair. Labels: Beavers. Cottage for Sale Lake of Bays. Bondi Village Resort. 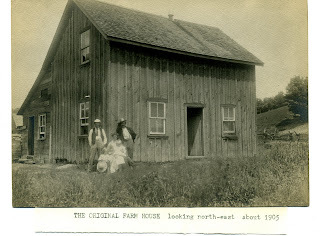 When Joseph and Elizabeth Tapley arrived here in May, 1905, the place didn't look like it does today. 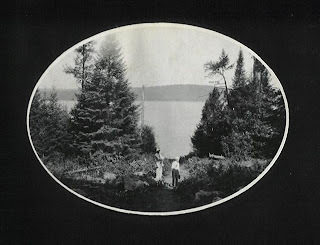 While Elizabeth and the two young boys, Douglas and Percy, stayed at Port Cunnington Lodge, Joseph checked out farms that were for sale. He rejected some for being too rocky. One for being an Island... we're a little upset about that one, with hindsight, since it was Bigwin Island, pretty much all of it... but Grandpa had a point -- come winter, the livestock could just walk away, and come spring and fall the folks living there couldn't. He was about to leave, seeking his fortune as a farmer somewhere farther south of here, when he came across this piece of land at the head of Haystack Bay. Mr. McIelwain was farming it -- and it boasts a pocket of some of the nicest farm soil in this area, an area better known for the superior quality of it's granite rock. Nowadays, people often ask us where the name came from, because they don't see the resemblance. Fair enough: Bondi Beach has been heavily developed. And it has a lot more beach. Not to mention Great White Sharks. 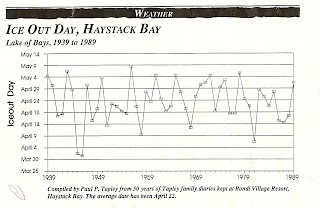 But... back in 1905 there was no dam at Baysville. 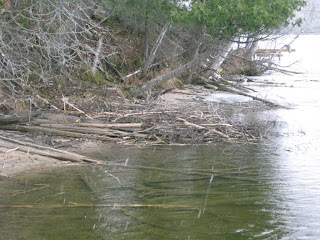 That dam raised Lake of Bays about 5'. That's a whole lot of water. We can see the resemblance. Labels: historical Lake of Bays. Water levels. Baysville dam. Brian zipped over to Algonquin Park to pick up our annual Park Passes (all reservations at our resort include entry into Algonquin, or Arrowhead Parks for our guests). He'd barely made it through the gates when he found his first moose of the spring, merrily munching at the edge of the road. Check out the Visitor Centre. It's uncrowded, and uparalleled. And we've got great Spring Specials to go along with it. Perfect. Labels: Moose. Algonquin Park. Bondi Village. Lake of Bays. This might be an odd place to post my comments on the upcoming Public Meeting for the Lake of Bays Budget, but on the other hand, it is MY blog, and I am a councillor (for Franklin Ward), so why not put it here? After all, if the reader is not from the Township, or doesn't care that the budget is currently hovering around the 10 - 14% increase level, there's no need to read any farther. Get outside and enjoy the day. The Public Meeting is March 27, at 9.30 a.m., at the Township office. Details can be found on the Township website. And some of my thoughts can be found in the following post. This is a very difficult budget year in the Lake of Bays, and there are many items on the table for discussion, so it is important that you attend the Public meeting, or send your comments. There are a great many more issues than whether or not we should be hiring for the position of the Community Co-ordinator this year. All of them will have financial impact. When we embarked on the Strategic Plan, it was clearly identified that there were projects that were beyond the scope of the Municipality – and community groups were formed to consider some of these and bring forward ideas, suggestions, etc. to the Council for possible implementation. Since the high points of the Vision seemed to be focused on Communication and Fiscal Responsibility, one might reasonably expect that suggestions would need to be affordable, and reasonable, well discussed openly. Indeed, for the group working on Communications, that seems to be the case – this group has already brought forward to Council some well thought through suggestions, for Council to consider along with the Business Plans being developed by each department at the Municipality. Many of their items dovetail well with these business plans. Among these is improved website – total cost $10,000; and increased advertising in the local papers – total cost $29,000 in this year’s budget. Speaking with this group, they have told me that they don’t expect it to all happen in one year, even two, and that they feel that even a $5000 improvement to the website would suffice for this year. Dorset has had one meeting, with an outstanding facilitator, but has yet to work their plan forward to the point where it is ready to bring to Council. Dwight has not yet met, nor has Hillside. However, Dwight has already formed a core group, Dwight Improvement Group, of business owners who are looking at a Master Plan for beautification, public washrooms, etc. This plan exists – it was pulled together for a G8 application – so it is already in place. This group also has grant writing expertise, and is prepared to write their own grants, as they did for the G8 application. Many of the groups have yet to meet. Councillor Burgess, who was the Council Liaison during the Strat. Plan process, is continuing to act as a liaison point for these committees. At this point, I don’t see the need for a $55,000/year to ‘co-ordinate’ the groups – let them meet, let them talk, let them develop plans from the grass roots up (the way it was intended to work) and let them talk to each other... There is tremendous expertise in our community and much of it is already at the table with these groups. The plans they develop won’t be in this year’s budget – timing will prevent that. There is no reserve of money set aside to finance or match grants for projects that are yet to be determined, so reasonably, these will be developed and considered this year, for implementation in the following year. Or years. I find it misleading to indicate, as Councillor Casey has done, that the increase in tax is “chump change” (her words) and equivalent to a few cups of coffee. We have already absorbed into the base budget the 8% increase in assessment values. With the very base budget, before the Changes in Service Level, etc. are added in, that would mean that on $100,000 assessment, you would see a decrease of $4.50 on your tax bill. Except for the fact that you would now, with the 8% increase, be paying on $108,000 of assessment, which will most likely absorb most of that right there. At present, following LOBA’s calculation, if all the additional requests are granted, the tax increase would be 14%. That is considerably more than a few cups of coffee. Yes, the Township only gets .20 out of each dollar, the rest goes to Education and the District, but it still adds up. With all the contemplated service level changes, required items such as legal costs and compliance with accessibility legislation, etc., there is going to be an increase in the budget needs. At this time, we have no money in the budget for gravel, or for a Public Works Reserve – arguably these are important items to our ratepayers, and perhaps this year the money for the Community Co-ordinator position might be better channelled into that. The Libraries have requested 9 additional hours at each branch for one more person – that would ensure that there are always two staff on hand. Given that the two libraries show that last year they had just over 5000 registered users, and over 2900 people attending library run programs, it can be argued that these buildings are truly the hearts of the community, and are very well used. Perhaps putting $24,000 into extending their hours would be more worthwhile this year than hiring a Co-ordinator. Councillor Casey has argued that having the Co-ordinator would allow projects to go forward, and she cites the replanting of the Township office property and adding shade trees along Dwight Beach, as well as perhaps finding funding to improve the Dwight rink. Since one of the items for consideration this year is a $500,000 addition to the Township offices to alleviate the crowded working conditions, one must wonder if this would be the right time to landscape that site. Regardless, if the Dwight Improvement Group who are working on a community master plan for Dwight deem tree planting to be desirable, there is nothing to prevent them applying, in partnership with the Parks and Rec Committee, for a grant from – for example – Tree Canada. There is currently $15,000 in the budget ear-marked for ‘exercise equipment’ for Dwight, and $5000 for Trail signage. Perhaps this money would be better directed, this year, to repairs and renovations at the Dwight rink. It is something to consider, and could be easily accomplished without hiring another staff person. It can be argued that improving the economic attractiveness of our community to attract more jobs, etc. might be better served by improving the roads – there is no money in this year’s budget for gravel, for instance, and a $500,000 debenture is being considered. That would provide gravel for 24 km of roads, and would add @2% to the budget. We’ve put the fire department on hold with their long-term program to keep the trucks current. Should we be giving more support to the Volunteers who are the first people through the door when there is a medical or fire emergency? Should we be considering how we can better support the Fire Department? The high assessments, extensive road infrastructure (much in need of work), low labour pool and high taxes in Lake of Bays may have something to do with economic attractiveness and the difficulties therein. Come July 1st, Ontario will have the distinction of being the most highly taxed tourism destination in North America. Tourism remains the most important Economic Driver in Lake of Bays, but the economic climate has not been kind to tourism, anywhere. Many factors have come together to make it a tough time for that economic driver. Ms. Casey has argued that the high assessments are good, because it increases the value of the investment. That’s true. The value of the investment is realized when the owners sell and move elsewhere. It is not realized by those who want to hold onto the cottages and homes they have held for generations. But the darker side of that is that it attracts people who are Invested in their Investment. They are not Invested in their Community. Some of the issues are big ticket. Some are pretty much going to be forced on us because of legal or legislative requirements. These ‘hot topics’ are those that are, if you will, above and beyond the budget. So, yes, please do come to the Public Meeting. We need to hear from as many of you as possible. I don’t feel it is our job as a Council to “sell” the budget to the public – I feel that is our job to listen very carefully to your concerns, and then to make the choices, understanding that we cannot have everything, and we certainly cannot have everything all at once. There is one other caveat that makes this an interesting year: Council will not meet during June, because of the G8 summit and the expected commotion. After Sept. 1st, because of Elections, it will not be possible for Council to initiate any programs that are not already identified in the budget. It’s called “Lame Duck” council. It’s there to ensure that the existing Council cannot saddle the new incoming Council with unworkable or expensive iniatives. To my mind, we should be spending this year identifying what matters, and then making the recommendations to the incoming Council . We should not be hiring a position that will commence just about the time the Council becomes “lame duck”. But you may have other ideas. You may be happy with the proposed tax increases. That’s why we need to hear from you. Labels: Lake of Bays. Township of Lake of Bays Budget Process. Budget increase in Lake of Bays. It's official. Spring is here. You can tell by looking at the calendar. Or you can look out the window, where every day new birds are arriving. Some of these come straight to the bird feeders, grateful to find a snack waiting them upon arrival. It's been a quiet winter for birds at the feeders around here -- the theory is (fingers crossed) that the very mild winter allowed them to stay out in the woods, or farther to the south of us. Whatever the reason, we are delighted to see the blue jays, chickadees, nuthatches and woodpeckers back to visit. Add to the mix the starlings, cowbirds and grackles who have now arrived, and it's getting noisy out there! In the fields, the sharp cries of the killdeer announce that winter truly is OVER. A robin has been sighted, hop hop hopping along. Canada geese are heard in flight -- and sighted on the nearby golf courses. We hope they stay there. We love the look of the geese, we just prefer to admire them from a distance, and go to extreme measures to ensure they don't decide our docks and beaches are good places to gather. As recently as five years ago it was incredibly rare to see a Canada goose floating about on our lake -- they just touched down for a quick rest before continuing their northern migration. Now, like the Toronto geese, they seem to stick around, and that's a shame. It means we can no longer greet those fantastic V-shaped and honking flights with as much delight. A pair of geese, with a pair of goslings, drifting softly by of an evening is a sight to dream about. 50 geese taking over the docks and shores is not. A gentleman with a cottage on Dwight Bay called me to report that his neighbour was not only feeding the deer on her front lawn all winter long, but in the summr was actively feeding the ducks and the geese. The lots along this particular stretch of lake are narrow and small. The docks are close together. This gentleman can't take his grandkids to the beach, through the droppings of some 40 deer, because she was last summer feeding 50 geese... and untold ducks. The docks, the beaches, the very water supply for those cottages was fouled. The geese were happy. The lady looking out her window at them was perhaps happy. He called me to get some advice on how to keep the geese away. In such close quarters, with such a ready food supply, he's got a big job ahead. 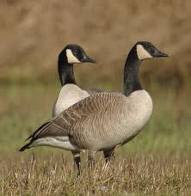 In truth, the geese would be far better off, as would the deer, if left to live their wild lives in the wild. Keeping your shorelines natural, with shrubbery rather than lawns, helps discourage the geese from coming ashore. Of course, then they'll sit on your dock... Or just dabble along in the shallows. When sweet reason fails with the neighbours, problems arise. The techniques used by airports, for example, are not neighbourhood friendly -- patrol dogs; loud banging noises; brightly flashing lights... none of these will get you invited back for coffee. There is a universe of difference between a child tossing a bit of food to a small family of ducklings and someone putting out 40 pounds of cracked corn... Up on Limberlost Road, the good folks have a similar problem. 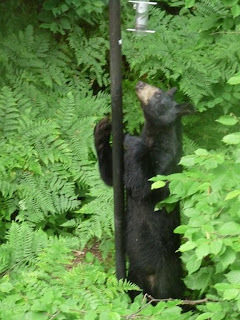 Not with geese... or deer... they have a resident who enjoys watching Black Bears. Last summer, she enjoyed watching about 13 of them eat the food she put out on her front lawn. The people living near her, who suddenly had 13 bears ambling across their property, enjoyed it much less. The people who used to ride their bikes past this house had to cease and desist -- a rolling mountain bike is like a lure for a bear to chase. There is no good reason to feed predators, to lure them into your yard, or near your neighbours. Bears belong in the woods, and away from people. 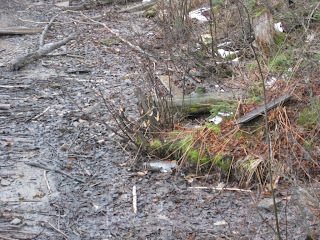 People have a responsibility to those bears, not to leave garbage, or other food items, around that would lure the bears close to houses. The slogan is To Feed A Bear is to Kill a Bear. Bears that have lost their natural fear and respect for people can be lethally dangerous, and are all too frequently shot for the crime of being hungry. We enjoy seeing the wildlife around us -- but we also respect that wildlife, and we prefer when it remains wild. It is an issue when the deer who were born on our property and who remain with us year round are so bold as to go inside the stable to eat the chicken food (which is in the chicken coop... which an enterprising deer can just barely reach by sticking its head through the chicken sized door) We have timothy grass hay outside in winter for the horses... and the deer take advantage of that. And we have a lot of open lawns and natural fields around the resort -- and the deer take advantage of that. And yes, we don't mind when people toss a carrot or an apple to the deer, cameras in hand and children's eyes wide. But we do not advocate the "dry lot feeding technique" we see of people putting out huge amounts of high protein alfalfa hay and cracked corn just for the deer. It plays havoc with their metabolism, which is intended to slow down in the winter so they can survive on twigs and buds and the like, and it means they require WAAAAAY more food to get by. We also have a local wolf pack, who were busy this winter, reducing the herd numbers of the deer. You hear some folk complain about that, siding with the deer -- sometimes siding with the very deer they are feeding in large numbers (one of the feeding stations was boasting they had almost 100 deer coming in for food). If you congregate a large number of prey species in one place, you should expect to find the predator species arrive. Labels: feeding wildlife. Lake of Bays. Jim, who has a cottage near Bondi, reads our Blog (thanks, Jim!) We hooked him with the story about the Bigwin Water Tower, and he's been reading ever since. Recently, he acquired an old photo album. It's labelled "The Hungry Bunch, 1910 - 1911, Lake of Bays." That's it, that's all... He's trying to dig up some more information about the photos, and to that end, he sent some to our Blog. We're including a couple here, just in case someone out there (probably along the South Shore, near Glenmount perhaps?) jumps up in excitement, pointing at the screen and shouting "look, there's Uncle Bob!!!" 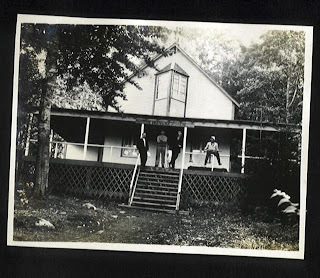 If you recognize this cottage, or this leaning tree, please let us know. 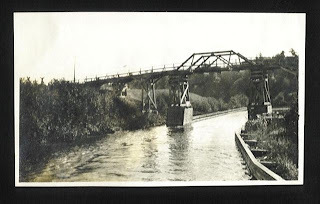 The bridge we've got identified: it's the old one-lane original bridge across the Canal, at Deerhurst. 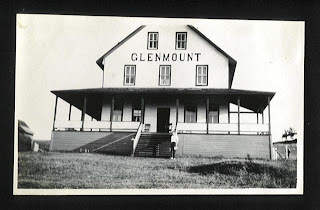 And that's obviously the original Glenmount Hotel.. I'll be adding these photos -- and the others Jim took -- to our Historical slide Show, so you can snoop about in there if they look familiar (or even if they don't) It's a gentle reminder of a time when we worried less about high speed and plasma tv's at the cottage, and more about the sailboats, and firewood, and the good times together. Labels: history of Lake of Bays 1910 - 1911. The Hungry Bunch, lake of bays. Our guests this week took full advantage of the great weather. Not to mention the selection of Season's on offer. Right on the change of the season, they were able to toboggan, and downhill ski ... but they were also able to hike to the Mountain top without getting wet feet. Some of them, out in the dark discovering the great echoes in our bay, were able to take advantage of one of the small bonfires Brian and David were using to help with the spring clean up along the shore. The younger ones collected eggs, and fed carrots to the horses. Jake learned how to hoot like an owl, and Anna can now lead you from Orion to Taurus, to the Seven Dancing Sisters in the Pleiades. And yes, these were the ones that took the plunge off the dock as well... ushering in the swimming season. What do you do on a day when the temperature record reaches a new high? The girls rolled and flapped and stretched their necks, enjoying their Spa Day. And then, they found sunny spots along the wall of the stable, said ' to heck with the Sunblock' and spent the rest of the day just soaking up the rays. What a beautiful contrail we had etched in the sky tonight. Don't you wonder who is in those planes? Where they are headed? Where they're coming from? Wherever, the weather could not have been nicer than we've been enjoying this week! There seems to be some ceremony around this event, however. Over and above the collection of family, general cheerers on, and the essential holders of the towels. There was a great deal of discussion and manouevering for position to ensure the minimum amount of time spent IN the lake, and the maximum amount of speed in EXITING the lake. Prior to this year's flying leap, the boys crafted a sand model of the good ship Titanic, complete down to the three stacks, and the pointy bow made famous in the movie. Spectators were assured that the water in the shallow pond circling the boat were in fact extremely warm. Perhaps that's so, because that is where the lads went as soon as they themselves were free of the ice flows. Labels: Titanic. Bondi Village. First in the Lake. One Busy Day, and Night! What a day! We were outside in t-shirts. Brian returned home from a side trip to the city, where the weather was foul. He couldn't believe that we'd had such lovely sunshine all day long! We have some guests here for the March break. Anna and Jake were drawn to the stable like it was a magnet. They hunted for eggs, along with Vickery, and were delighted to find several green tinted eggs, and two that were a pale pink. They laughed to learn that Achmed had live-released a flying squirrel in my house at 4.15 a.m., and I'd spent an hour retrieving the little guy. The cats were not as helpful in this venture as one might have hoped, but it all ended well. We came down to my house to look at flying squirrel pictures on the Blog, and that lead us to listening to wolves and owls, and that lead us to looking at the difference in owl feathers and raven feathers. We talked about how the owl's ears are slightly off-set, to help them locate sounds quickly, and how the Barred owl is the only one with lovely brown eyes. Jake and Anna took a feather home to show the rest of the family. Then it was off to the toboggan hill, which, being on the north face of the hill, still has great snow! The only problem was it was too hot for snowpants! Tomorrow, the kids are all heading out to Hidden Valley for some downhill skiing, so they're getting in their snow time! Tonight we all went out onto the lawn -- which is suddenly almost completely free of snow and dry! -- and looked at the constellations. Andrea told me she never sees stars where they live, not even the bright ones. Certainly not well enough to pick out the different constellations and planets. 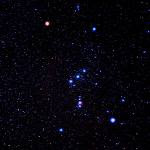 We had a great time, tracing Orion, and lining up along Orion's belt to take ourselves out through the universe -- left to Aldebaran, the bright eye of Taurus, and on to the Pleiades: right, to Sirius, in Canis Major. Everybody knows this star's name now, it seems... thanks to Harry Potter! We also found Canis Minor, the smaller of the two hunting hounds that follow Orion, and we found Gemini, Castor and Pollux. In the northern sky, we traced the Big Dipper, currently standing straight up on the handle. 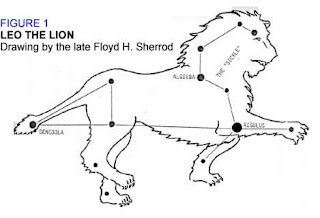 That took us to the Little Dipper, Draco the Dragon, Casseiopeia and Andromeda... and then in the opposite direction to Regulus in Leo... Leo is a great constellation -- you can actually picture a lion here, by connecting the star dots! Which seemed quite enough for one balmy evening in the middle of March! We had no luck with the local wolf pack. Perhaps they were the other side of Lookout Mountain, or back closer to the Oxtongue Craft Cabin. Or perhaps they had remembered to set their clocks ahead and were already snug in their beds. 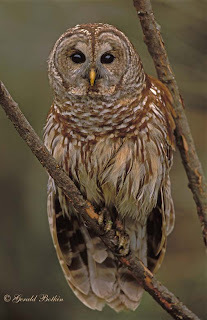 But... and what a beautiful but it was -- the Barred Owl happily hooted at us from the Lumina hill. I hooted back. He answered. Anna told her relatives about the way owls can fly silently. And Jake tried out his first ever owl call... 'Who cooks for you'. And yes, the owl answered him. Labels: barred owls. 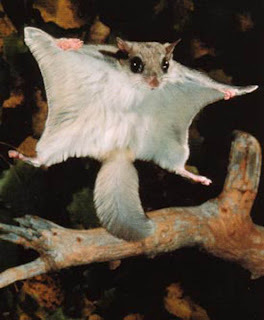 flying squirrels. star gazing. Orion. Leo. March break vacations. Bondi Village Resort. Last night the Hillside Pioneer Memorial Church 'got it's green on', hosting an Irish dinner and entertainment with Rev. Jolyn Campbell and Noah's Larks. For this occasion, they were Noah's O'Larks, and they were wonderfully into the spirit of the occasion. With a great 'family style' dinner of Irish stew, cabbage salad and soda bread to settle everyone in, the entire room got into the singing. Charlie donning his wee kilt for a nod of the head to the Scots in a rousing rendition of Johnny, Where's Yer Trousers? Jan, for taking on the part of the rather active village Dad in another song... and while I have no photos, no-one will soon forget the marvellous ladies who lead us through Seven Old Ladies got locked in the Lavatory. With more than 70 people in the room, there is an obvious hunger for evenings like this -- where the entertainment is made by everyone, and not spoon fed through a television monitor. Every table had a joke to present -- in the best Irish tradition, and several of the audience stepped up to recount an adventure they'd had in Ireland, or with their Irish ancestors. Such as the lady who's very Irish grandpa asked her to pour him a 'finger' of whiskey with his breakfast. She measured it out carefully. He took the shot glass, raised it to the heavens, and intoned, "Lord, we're having communion this morning"
What good fun, what good company, what a great time had by blending voices together to build not only strong songs but stronger communities. Well done, everyone.